Oil filled in the transformer must conform to certain commonlyh accepted quality parameters, regardless of whether the oil is new and dry or if it has been in operation for some time. If the oil in the transformer scheduled for servicing is acidic (degrading insulation as a whole), and does not pass the quality criteria, displaying low flashpoint, high ash content, low pour point, higher dielectric loss – the oil must be thoroghly treated and restored. To reach the requried results from the regeneration, chemical regeneration methods are used, of which the most important one is acidic/alkaline. This method involves treating the oil first by sulfuric acid to compact and bound all unstable compounds into acidic tar. The tar, which settles out, is them extracted, while the remaining sulfuric and organic acids are neutralized by addiing alkali to the oil. The oil is then washed with distilled water, the water is removed by centrifuge, and the oil is then treated by a special bleaching compound, which can also adsorb particles out of the oil. Final filtration yields regenerated oil. If a transformer is being repaired at a factory, proper equipment and materials are used for transformer oil regeneration, therefore the transformer is filled with either regenerated oil or oil from the exchange pool. If the reparis are conducted on site, the transformer is traditionally filled with new dry oil. If the performance of the transformer is degraded, but not quite so as to warrant major repairs (for instance, the transformer may contain certain contaminants, the dielectric strength is lowered, acid is a bit high or dielectric losses are a little higher), the oil is regenerated by such methods as centrifuge and adsorbtion by impregnation of sorbents, such as silica gel or zeolite. Oils with slight acidity, which do not require chemical regeneration, are traditionally regenerated by percolation through dried silica gel in an adsorber. The oil is heated to 50—60°С and makes at least three passes through the silica gel. The silica gel, as a rule, removes resin-forming acids and water. However, if the oil’s water content is high, silica gel will not be able to dry it. Therefore, when treating the oil with high water content, the method also involves several runs through a centrifuge or a filter-press, if the oil contains such solid contaminants as carbon. Waste silica gel is reactivated by heating in special systems. Drying of transformer oil requires approximately 0.1—0.15% of zeolite of the mass of oil treated. In one cycle, dielectric strenght increases from 10—12 to 58—60 kV. Oil is dried at 20—30°С at filtrartion rate of 1.1—1.3 tons an hour. Adsorptive performance of zeolite is restored by purging the adsorber with hot air (300—350)°С for 4 — 5 hours. 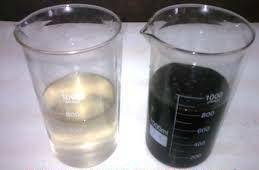 Presence of air in the oil causes oxidation and aggravation of the negative tendencies in terms of dielectric qualities, which is due to electric charging and ionization in the elecrtic field. Usually at atmospheric pressure the oil contains up to 10% of air by volume. At the same time, when air is heated with transformer oil, the gas content changes. Air contains 78% of nitrogen and 21% oxygen, while the air in hot oil contains 69.8% nitrogen and 30.2% oxygen. Solubility of air in oil also grows with temperature. Preparation of transformer oils for filling into equipment and purification of oils from water, solids and oxidation products while servicing the transformer may be done using CMM machines made by GlobeCore. CMM systems feature oil heaters capable of heating the oil from sub zero temperatres for operation in winter conditions. The oil passes consecutively through sections with electric heating elements. To prevent charring on heater surface, a gear pump facilitates internal circulation. A valve in the heater allows to pump and circulate the oil simultaneoously while maintaining constant output. Oil regeneration includes cetrifugal and adsorbtion stages, which allows to increase economic yield significantly and extend sorbent lifetime practially indefinitely. A 900 liter per hour CMM system in one pass removes up to 80% of total water (free and solved). The rest of the water is adsorbed by zeolite (adsorbtion section), facilitting 10 – 20 ppm water output. The adsorbtion section has 8 adsorbers containing zeolite cartridges for water removal or silica gel for removal of acid, oxidation products and water. Based on initial oil condition, the oil can be regenerated in one or multiple passes. The heater ensures optimal temperature for treatment by both adsorbent types (50°С). Oil is heated in one pass. The systems may also be used as stand alone applications for heating and transfer of oil in storage of service facilities.